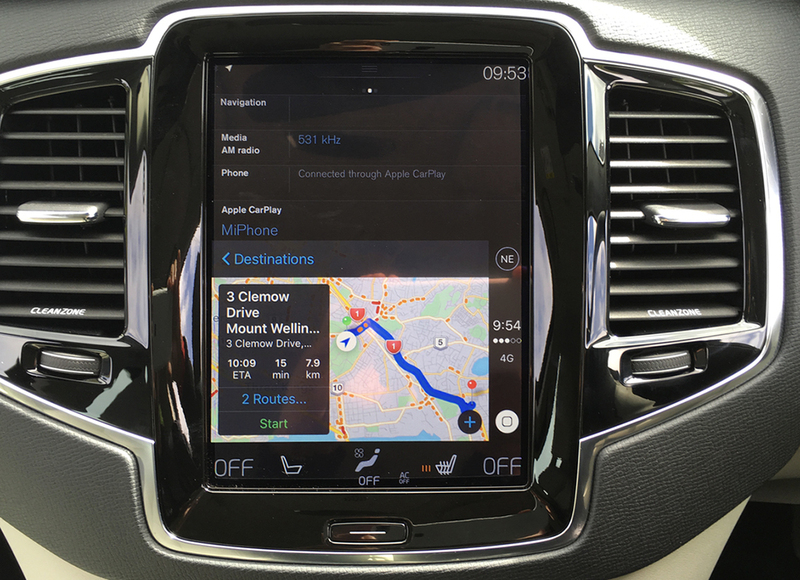 The new Volvo XC90, a well-appointed and high-tech SUV, supports CarPlay via cable into a USB port concealed in the centre console, where you can leave your iPhone (charging) as you drive. There isn’t room for an iPad (it’s not supported anyway – it needs 3G-4G for Siri and Map functions – but an iPhone 6 or 6s Plus fits easily. Supported models are iPhone 5, 5c, 5s, 6, 6 Plus, 6s and 6s Plus as long as they have iOS 8 or newer as their operating systems. CarPlay functions are displayed on the central 9-inch touchscreen. This is one high-tech car. It seems to be festooned with cameras, although I didn’t actually spot any of them. 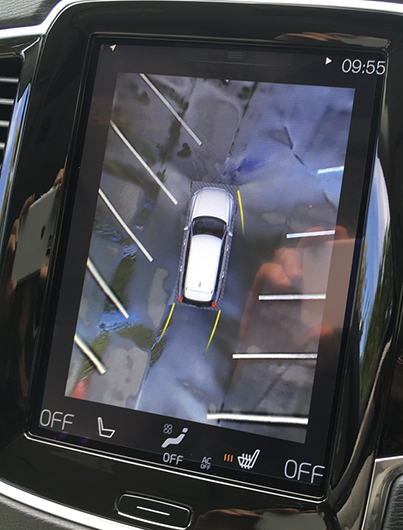 Start reversing and the centre touch-screen becomes an animated procedural (right) to show what’s behind you; stop parallel to parked cars and cameras spring in to life to assist you – or just tap the auto-parking option on the touch screen and let the car do it for you. In the model I drove, everything was matched cream leather, including the steering wheel. My favourite XC90 feature by far, for just driving around, is relatively simple: your speed and the current speed limit are projected onto the windscreen very clearly even in full daylight. This means you always know what you’re doing without ever having to lower your eyes. Exceed the speed limit and the speed-limit indicator blinks. (Exceed it by a lot, apparently, and the car activates various warning devices.) I wish every car had this heads-up display. Dashboard-wise, directly in front of you, Volvo has opted for another screen display instead of analogue dials. The speed, RPM and fuel/trip appear on this, with fuel given as how many kilometres you have yet to travel before you need a refill; the large space in between them is a seamlessly updating map. To further ease your use, and improve your safety, there are thumb-tip controls on the steering wheel for Siri, music volume up and down and previous or next track on the right, with a Home button in the middle. You’ll soon be using them without looking. 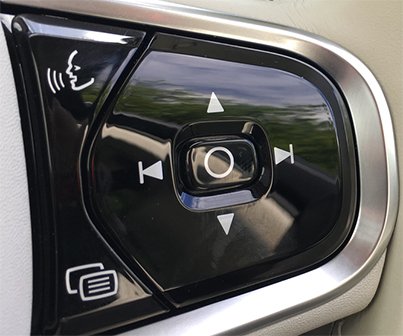 A similar panel on the left side controls the adaptive cruise control: set your speed, nudge it up and down a few kph to suit surrounding traffic speeds and even set a distance to maintain from the car in front. Various other cameras and sensors make themselves known in different ways. Driving up a fairly narrow road, the XC90 flashed warning indicators on the windscreen that a car was approaching. Over the top, in this instance, as there was room enough, but I appreciated the thought. There’s even a warning if you drift out of lane, for tired or otherwise inattentive drivers. There’s also cyclist and pedestrian detection, and forward collision warning. We used to educate drivers to be defensive – now the car takes care of it. 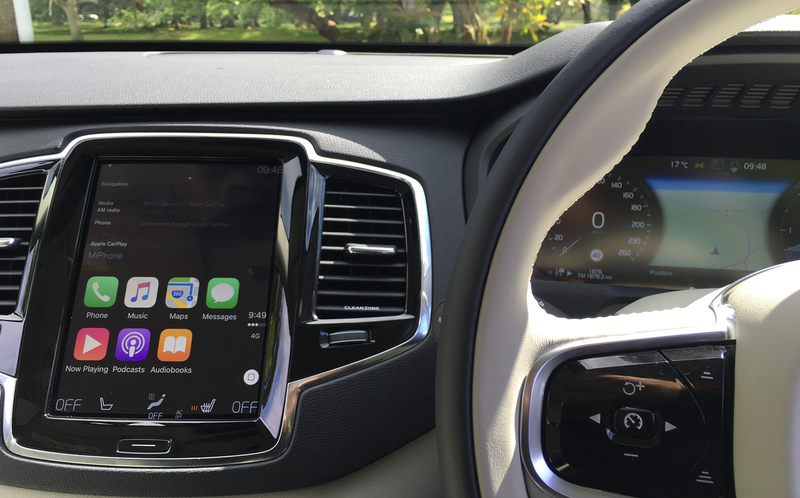 CarPlay in the Volvo leaves the top half of the Sensus display with typical car functions: radio, onboard navigation, time … The display even has the car manual in it – no more groping around in the glovebox. This car has GPS and it’s always working, even updating local traffic info (which almost isn’t necessary in Auckland any more, as it’s just bad all the time, everywhere). 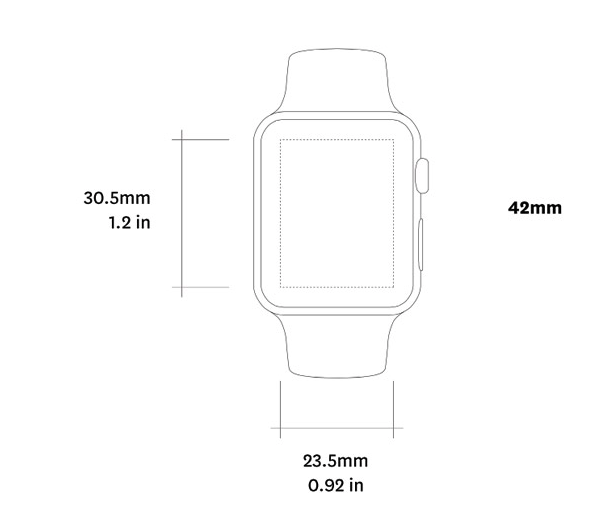 But I have got really used to navigating with my iPhone and I like the interface, and I also like the tapped prompts on my wrist via Apple Watch. Seven apps are supported on the CarPlay interface, in my case – you can search for ‘CarPlay’ in the App Store to see what apps support the interface, so it depends what you have installed – Spotify supports it, for example. In my case the apps were Phone, Music, Maps, Messages, Remote (‘Now Playing’), Podcasts (just in time for the new Serial series, yahoo!) and Audiobooks – and not Mail. In the hot seat — Actually, I mean that literally. I turned on the seat heater by mistake – a simple tap on its indicator sorted that out but it took me a few minutes to realise what was going on. Those Swedish climes clearly appreciate some under-body thawing enhancements during their long winters. CarPlay was added into the car’s onboard capabilities via a software update. You plug your phone in – the cable means you don’t need to worry about Bluetooth dropouts and besides, it charges your iPhone. At the same time, you get much better sound quality than you would via Bluetooth. The first time you plug in your iPhone, your iDevice appears on the screen, it pairs and you’re off. From then on it remembers it, so you can support several devices (your friends and family can fight over music rights on long trips). A round icon at bottom right is your Home button, as per iPhone, and there’s a hardware Home button too, underneath the screen, and in the middle of the steering wheel controls. It’s awesome being able to drive to your own music – I got a couple of startled looks as I cruised down Remuera Road with Joy Division blaring out. This car has a really excellent sound system. When a call comes in, tap the screen to accept and the music quietens down. Call clarity is excellent and I’m not sure where the microphone is inside this cabin, but the other person had no trouble understanding me. Siri works a treat too: ask for directions, if it’s raining at your destination or to make a call, since this is an entirely hands-free system. I tried to call my dad and it defaulted to his mobile. Since he was at home, he wasn’t answering that and it took me a few go-rounds to get Siri to dial his home line. Stupidly, perhaps, I asked Siri to dial ‘dad’s home line’ and ‘call dad’s home phone’. Finally, ‘Call Dad home’ nailed it – I guess if you do this a few times you work the correct language out. But note that it definitely pays to set your voice to New Zealand English in the settings of your iPhone! It does a much better job of understanding our virtually vowel-free Kiwi speech. CarPlay can also read off addresses from text messages, contacts and dates and suggest destinations where you might want to go, in case you’re roving about the countryside trying to get to your friend’s batch, for example. I really appreciated the calling – it’s no harder than chatting to someone sitting next to you. You can reply to Messages too, telling Siri what to type. While this works, I think most people would just call people back rather than try and wrangle typos and mistakes while driving. Maps is good though, since you can use it on the touch-screen the same as if it’s on your iPhone, without having to get the iPhone out at all. To get out of any CarPlay app you have running, just swipe the entire screen; then you get all the XC90 functions to tweak: air conditioning, seat temperatures, radio etcetera. Conclusion — CarPlay will obviously expand out in functionality as Apple hones the service and as more car manufacturers come on board. Just the other day, General Motors in America, which has rolled out support for Apple’s CarPlay iPhone integration faster and across more models than any rivals, stated its independent dealers report CarPlay draws in customers and helps them close deals in selling new cars. If you’re wedded to your iPhone (as I am) it’s really wonderful having it at your fingertips in a car, and for me the biggest bonus was being able to listen to my music. I know lots of people can do this, but my own car is too old to splay anything from my iPhone through the car stereo. Volvo XC90, NZ$97,900 for D5 Momentum through to $136,900 for the T8 R-Design. All-wheel-drive, anti-skid system, numerous safety features, seven seats … And no, I did not buy one! Apple Music team working on fixes, improvements through end of 2015, says iTunes VP — Apple still has “a bit of homework to be done” throughout the rest of 2015 to improve Apple Music, including fixing problems with the service’s interface and handling of local iTunes libraries, an iTunes International VP said on Thursday. Siri for college (ie, University) — College life can be hectic. Classes, your social life, fitting into someplace new are all challenges students face. Fortunately, Siri can make things easier: from dictation to location-awareness to grabbing a late-night pizza, Apple’s digital assistant has you covered. Here’s how Siri can make your school day easier. Google Street View gets its own app — Google has changed the name of a free app to Street View and turned it into a fun way to view photo spheres, take your own, and if a Street View vehicle has been driving around the area, even take a “tour”. Faster memory — Intel and Micron’s new ” memory is 1000x faster, more durable than NAND. 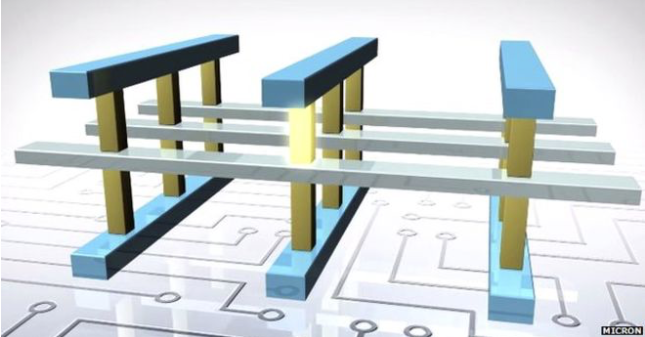 Semiconductor technology giants Intel and Micron have announced 3D XPoint memory, the fruits of a joint endeavor into non-volatile memory technology the companies claim is the first major breakthrough in the space since the introduction of NAND flash in 1989. Photoshop CS6 stragglers out of luck for Camera Raw Updates — Adobe left its Creative Suite 6 apps behind when it moved to Creative Cloud and annual software licenses, and if you’ve been holding out hope for extended support for the old versions of Photoshop, Illustrator, and InDesign, get ready for the bad news. Adobe says Camera Raw 9.1.1 will be the last version released that still offers Photoshop CS6 support. For people using Adobe’s apps professionally, this is another reminder that Creative Suite 6 is now a relic and it’s time to let it go. Windows 10 launches to favorable reviews, cautions about bugs and feature gaps — Early reviews of Microsoft’s latest operating system, released on Wednesday, have been generally positive, suggesting that it solves problems with Windows 8 while advancing the Windows platform towards the future. But there are a few crashing bugs and a few gaps. 1/ Eight levels — Whereas the Levels adjustment in Photoshop has just three sliders, Photos has eight. 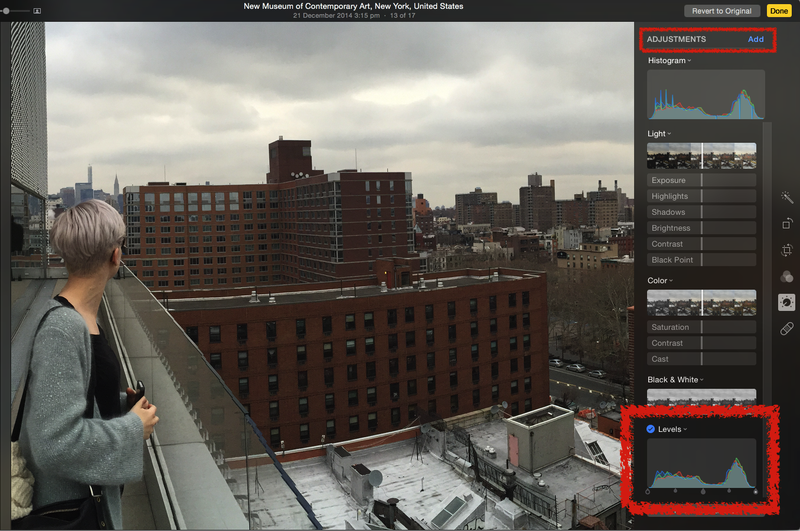 This gives you precise control over the brightness levels of all the tones in an image. For example, you can control brightness levels in just the darkest shadows, or just the midtones, or just the lightest highlights, plus in the tones that fall between shadows and midtones, and in the tones that fall between midtones and highlights. The secret lies in turning the feature on (and this also holds true for Histogram adjustment, below): select an image by double-clicking on it, and then click Edit at top right. Now find the adjust button on the right (it’s the fifth down, between Filters and Retouch) and click that. Now, click ‘Add’ – it’s in blue near top right. Under Advanced, choose Levels… This gives you awesome control over different spectrums of your images. 2/ Histogram — You can adjust the RGB histogram, which shows where image data falls in the red, green, and blue graphs superimposed atop each other – or each colour channel’s individual histogram. You can also adjust the luminance channel, which produces a histogram based on how our eyes perceive colour. This hidden talent lies just under that little three-line-and-dot icon the right of the ‘Auto’ button (above). 3/ Add text to any slide in a slideshow project — Activate a slide in a saved slideshow project and click the plus symbol at lower right of the Photos window (not shown). From the resulting menu, choose Add Text. Highlight the placeholder text that appears and enter whatever you want. You can’t change the position of the text, but you can change fonts, size, and text colour using OS X’s Fonts panel. 4/ Add a custom vignette — You can apply a customisable dark edge vignette to any picture: open an image in Edit mode and then click Adjust (there’s a shortcut for this, BTW — just press the A key on your keyboard). Now click the Add button at upper right and from the resulting menu, choose Vignette. Use the Radius slider to change the size of the vignette or rather(you may have to activate this by clicking the Disclosure Triangle that appears to the right of the Auto button when you put your cursor there). Drag the control right to make the vignette bigger or left to make it smaller. Use the Softness slider to control the width of the transition area between what is darkened and what isn’t. Drag it right to increase the feather effect, thereby making the transition wider and softer. Click the blue circle with a white checkmark to toggle the vignette off and on to see a before and after. 5/ Customise Book pages — Have you noticed you can build books in Photos just like you could in iPhoto? It’s under the File menu>Create Book. Happily, you can change page layouts, swap pictures between pages, and add pictures to pages while you’re viewing all the page thumbnails in a book project. In other words, you don’t have to double-click a page to do it. This results in a much broader view of the overall book project than you ever had in iPhoto because you can still see all the pages while you’re designing the layout. To swap pictures between pages, click and hold your mouse button until the picture on the page sprouts a blue border, and then drag it atop an image on another page. To move the pages themselves, click to activate them and then drag the handle that appears underneath them. IK Multimedia, once known primarily for Mac, then iOS apps that act as amp profiles and stomp boxes, keeps releasing hardware to fill out the experience. 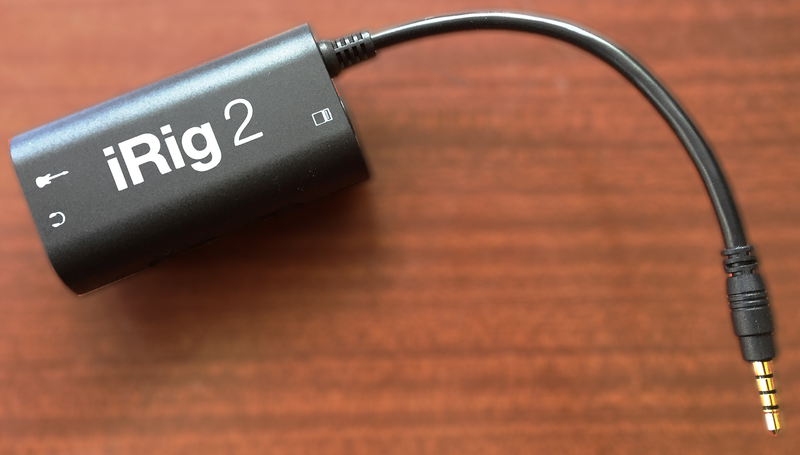 The latest, the iRig 2, is a little dongle that lets you plug a mic or guitar into an iPad or iPhone, with the potential to offer more than a direct connection with a straight jack to stereo-minipin adapter cable. This is smaller than an iRig Pro, which is square and chunky. iRig 2 is sleeker with rounded-off edges. It has nice, direct jack connectors – the iRig Pro’s connector has a smart, dual jack and mic connector at one end, but the other was an old-fashioned serial-port-styled port into which you could add a supplied Lightning or line cable. There’s nothing wrong with a serial cable connector as far as connectivity goes, but it’s difficult to get that plug aligned properly into the lug when you’re working in the gloom – and that’s petty much a stage state-of-being for most musicians. iRig 2 has a fixed cable coming out with the stereo-minipin, and that’s next to a standard 6.3mm (1/4-inch) guitar jack output which you can send to a computer or an actual amp. On the other end another standard guitar jack sits next to a stereo-minipin out for headphones/earbuds. Basically, adapting your guitar or bass straight into a Mac or iDevice with a line cable works, but there’s a distinct lack of volume and power. iRig 2 adds a little flexibility to that with a gain control, signal path selection and its variety of inputs and outputs. Your iDevice can add the pre-amplification. Also supplied with the 2 is a clip you can choose to install, meaning you can attach the 2 to a slim-profile guitar strap directly, or perhaps your lapel. But a supplied velcro strap can be threaded through this so you can attach the iRig 2 to a mic stand. On one side is the gain dial and a switch for ‘Thru’ or FX. This switch lets you select between a processed signal (FX) or the clean ‘Thru’ input signal, which does let you use your mobile device as a tuner, recorder or other tool while preserving the purity of a 100% analogue signal path. FX lets you use your AmpliTube or whatever. This is already pretty versatile straight out of the box, but IK expects you use it with its AmpliTube multi-effects processor app, which comes in free and paid versions to offer various amp and stompbox profiles. These apps are more and more cross-platform, with software that includes free versions of AmpliTube for iOS, Android and Mac or PC. Unlike iRig Pro, there’s no battery as iRig 2 has no onboard electronics – essentially it’s a patch cable with options, letting you connect your guitar to your iDevice. Your smart device has all the electronics you need, and can clean up and process your signal while adding effects and the amp profile sound you like, but the gain control adds a something missing from the original iRig line unit. 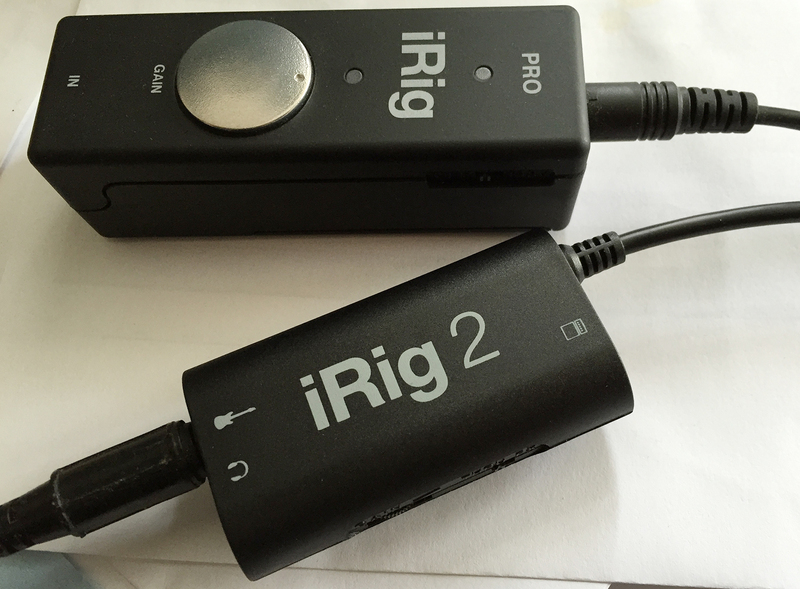 Check out a video of iRig 2 in action here. Mac NZ’s buying advice — iRig HD (NZ$169) offers a cleaner sound with more power since it has onboard battery-powered electronics, but it costs more. iRig 2 is a very handy, and very pocketable, useful device for what it does. iRig 2, NZ$99.95, available from music and guitar shops. System — Instrument input connection, 6.3mm jack, amplifier output connection 6.3mm jack, device output connection 3.5mm TRRS jack (guitar and mic combined), headphone output connection: 3.5mm jack (stereo minipin). Input Impedance 380kOhms, frequency response 20Hz to 20kHz (±0.2 dB). Most Mac computers starting from late 2008 are compatible with the exception of the Mac Pro line. To check if your Mac is compatible, from the Apple Menu select About This Mac>More Info>System Report>Audio and check that External Microphone/iPhone headset appears in the list of included features. More information — IK International. 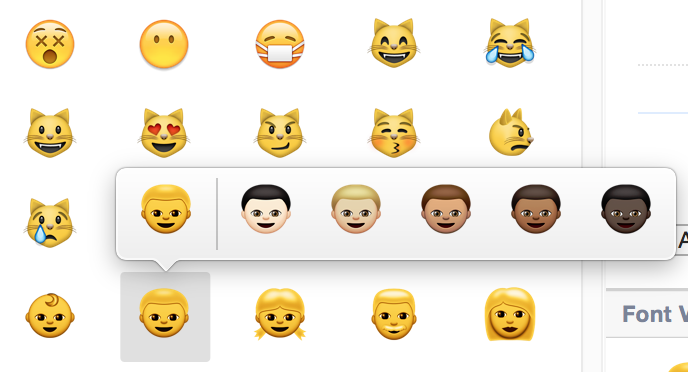 How to find new Emoji skin tones, Vulcan Salute in iOS 8.3 — You may have heard about the Live Long And Prosper emoji coming to iOS, as well as expanding the emoji keyboard to include a wider variety of skin tones. Here’s how to find and use those picture symbols. Apple revamps Siri informational webpage with example interactions, fresh graphical style — Alongside Wednesday’s iOS 8.3 rollout with expanded international support for Siri, Apple launched a redesigned expository webpage that helps explain how users can interact with the virtual assistant. Apple ranks 8th on list of companies granted mobile device patents for 2014 — Apple last year placed eighth in a list of companies granted the most mobile patents, above most of the industry but below some of its chief rivals, a new market report revealed on Thursday. Twitterrific 5.10 for iPhone adds muting, muffling, drafts and more — Iconfactory has released Twitterrific 5.10 for iPhone (free with in-app purchases) with some very nice new features, including drafts, muffle and mute. Adobe Slate takes another stab at ‘visual stories’ — Adobe just launched a new iPad app that aims to make anyone feel like a magazine editor. Slate is available now as a free app for iPad. Update to popular Scanbot app adds two powerful integrations — The app just received an update to version 3.7, and the developers added some extremely powerful integrations to the mix. Microsoft updates Outlook for iOS with new address book, calendar improvements — The busy iOS developers at Microsoft have released an update to Outlook that features a new address book and improvements to calendar. 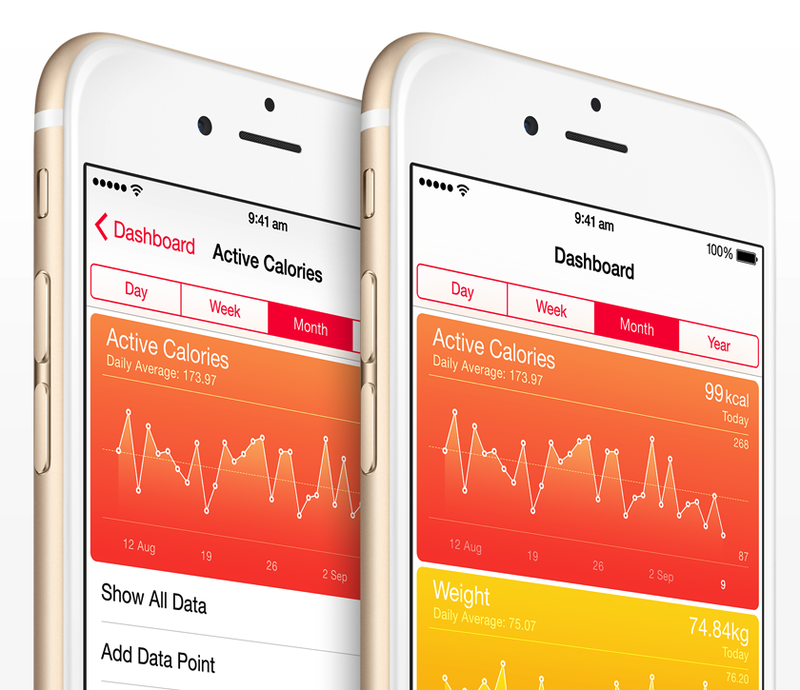 Apple concept would require users to input health data to keep using their iPhone — Apple has explored presenting iPhone users with non-dismissable notifications, such as requiring personal health data to be entered before resuming normal use of their device, in a concept that could help break bad habits. Twitter launches Periscope video streaming service — Twitter has released Periscope for the iPhone (free), which lets Twitter customers broadcast live streaming video with almost no friction at all. If that sounds familiar, it’s because Meerkat recently rose in popularity for doing the same thing. Behind the scenes look at CARROT, the AI construct that shames you into submission — Last week, developer Brian Mueller of Grailr released CARROT Weather, the fifth app in the popular CARROT series. The star of these apps is the unforgettable CARROT, a sarcasm-wielding robot with a heart of weapons-grade plutonium. CARROT is known for her cutting comments that shame you into compliance while helping you meet goals like being fit or waking up on time. Christy Turlington: Apple Watch Accurately Tracks Workouts without an iPhone — Apple Watch spokesperson Christy Turlington-Burns posted her Week Three blog entry in a series about training for the upcoming London Marathon. Mrs Turlington-Burns said in her Apple-sponsored blog that after a few uses, her Apple Watch learned enough about her stride that she didn’t need her iPhone with her to accurately track her results. Zen music while you work? For me that adds up to ‘tear my hair out’. Worldwide PC market staggers in Q4 … but Apple’s Mac reaches new heights — According to its quarterly PC report for the fourth quarter of 2014, research firm IDC found Apple sold some 5.8 million Macs over the three-month period, bucking an overall negative trend for the market. Shuttle bus drivers serving Apple, other Silicon Valley tech companies look to unionise — A Teamsters representative last week notified the CEOs of Apple, Amtrak, eBay, Genentech, Yahoo and Zynga that shuttle bus drivers contracted to service their employees are seeking to unionise. What to do if your Mac refuses to accept your password — Fortunately, if you have lost your password, there are several approaches you can take for either regaining complete access to your Mac or, at least, getting to the specific data you need. Here are some tips for doing just that. Watermark Plus adds watermarks to your photos quickly and easily — Watermark Plus (US$19.90) is a nifty app that pros and others wanting to protect their digital image creations will appreciate. You can create watermarks on your own, or use any of several templates provided. The app supports JPEG, TIFF, BMP and PNG formats. You have control of position, font, opacity and colours. Even better, you can apply your watermark to hundreds of photos at once by dragging a folder over a target on the app screen. Typed on special — Typed is the new innovative approach to writing web-ready content on your Mac. With beautiful typography, easy exporting, and an ideal minimalist interface, Typed will have you zoned in and writer’s block-free in no time. It’s 40% off for one more day.